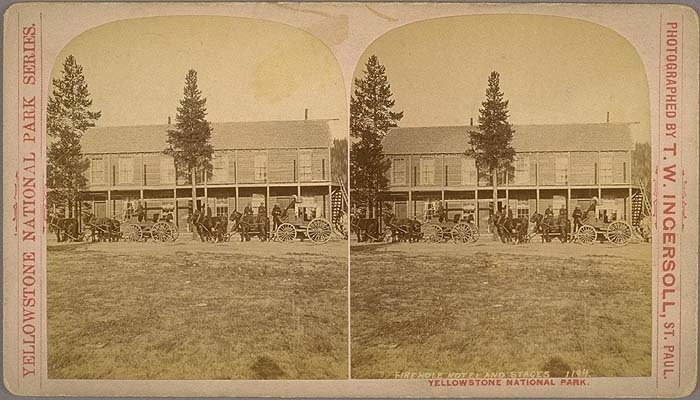 A resource for anything and everything related to the history of stereoview photography in Yellowstone National Park. GREATER NEW YORK STEREO CO. It is my long-term goal to compile the most comprehensive listing of Yellowstone Stereoviews possible. This project will probably take years and require the generosity of visitors and collectors to this website. Many different publishers have produced Yellowstone stereoviews and new ones are being re-discovered all the time. The number of individual Yellowstone views may well exceed 4,000. Please take some extra time to look at the checklist. As this is an ongoing project there will certainly be some errors and omissions in the list. The numbering and distribution of stereo views is extremely confusing. Many companies kept poor records, many did not number their views, or in some cases doubled up on numbers from different sets. Some publishers titled duplicate photos with several card or boxed-set variations, while others pirated views and negatives from rival photographers. Therefore there are undoubtedly some inaccuracies in the checklist. Truman Ward Ingersoll's, "FIREHOLE HOTEL AND STAGES 1194"
Also I have done my best to provide scans of as many Yellowstone stereoview variations as possible. Thumbnail views of over 250 different Yellowstone stereoview styles can be viewed on the Thumbnail Page. This page also includes links to each publisher and photo shown. In some cases the detail of the scans vary in quality. The images on this site are only as good as their source. Many views have been culled off of the internet, others are from my own collection or from private collectors around the country. If you would like to send scans for use on this website, they would be most appreciated. I am always looking to upgrade the quality of the photos listed. Please scan your views at 300 dpi and send them to the e-mail address below. I will do my best to list them on the site as quickly as possible. If you discover that you have Yellowstone views in your possession not present on the master checklist, or styles not listed here, please pass along the information so I can add it. The card publisher, number, and exact title are most important. I can be reached via e-mail at paulrube@comcast.net As this list grows, perhaps someday for the first time we will have a complete Yellowstone Stereoview History. 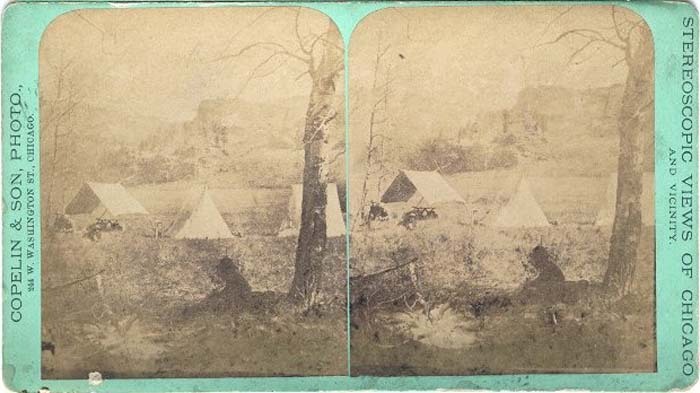 This 1871 photo by Thomas J. Hine, entitled "Meadow Brook Camp,"
of Chicago, it represents the earliest and rarest of Yellowstone stereoviews. In addition to the individual publisher pages, this site also has several other pages of interest. First is the Yellowstone Stereoview Publisher List. This list includes, all known Yellowstone publishers, cities of publications, dates of issue and the number of known Yellowstone views. Also each is linked to its specific publisher page. 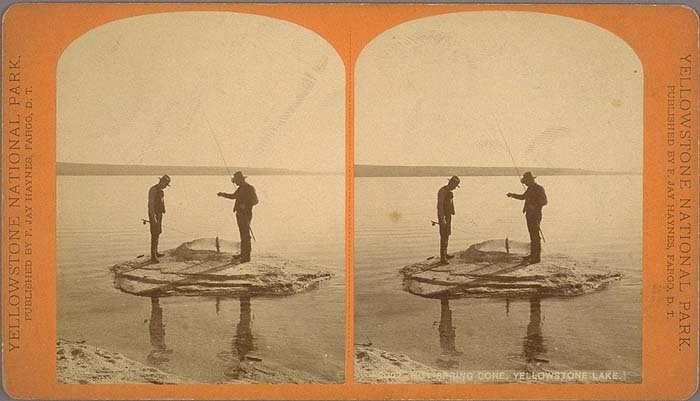 These two links pages provide many links to other fine Yellowstone and Stereoview websites respectively. The Collectors List is a place for collectors of Yellowstone memorabilia to list themselves and trade information, included are Collector names, hometowns, EBAY handles and e-mail addresses. Finally is a page with a listing of Stereoviews for Sale at a fixed price. The majority of these views will be Yellowstone or western views. Also for sale on this page in the future will be CD-ROM collections with hundreds of images of Yellowstone stereoviews. is one of numerous Yellowstone stereoviews by Frank J, Haynes. 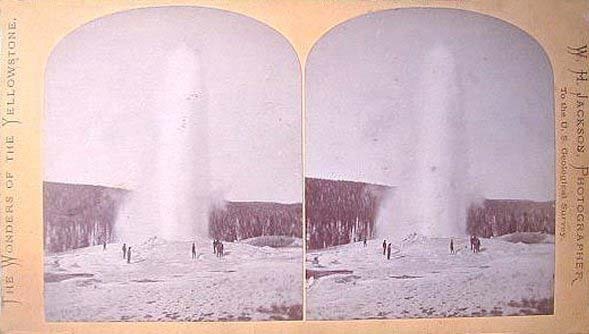 offering nearly a thousand Yellowstone stereoviews between 1883 and 1904. 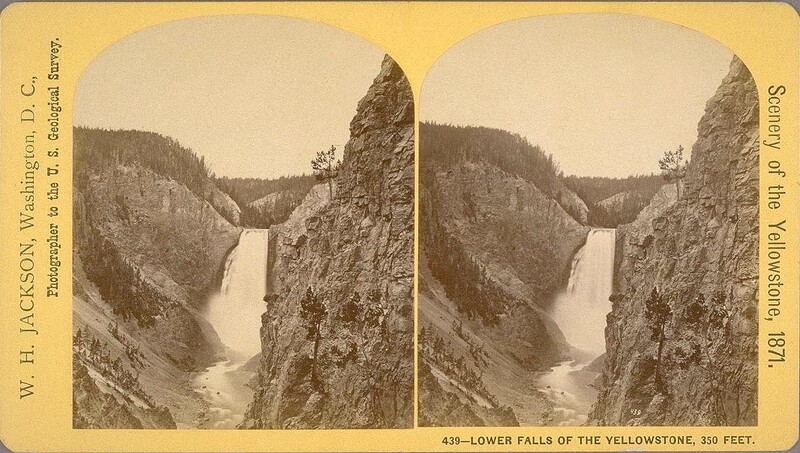 I hope you enjoy your visit to the Yellowstone Stereoview Page. There is quite a bit of information here and hopefully you will learn a bit more about your own collection.